Would you recommend Twitter Account Home to a friend? 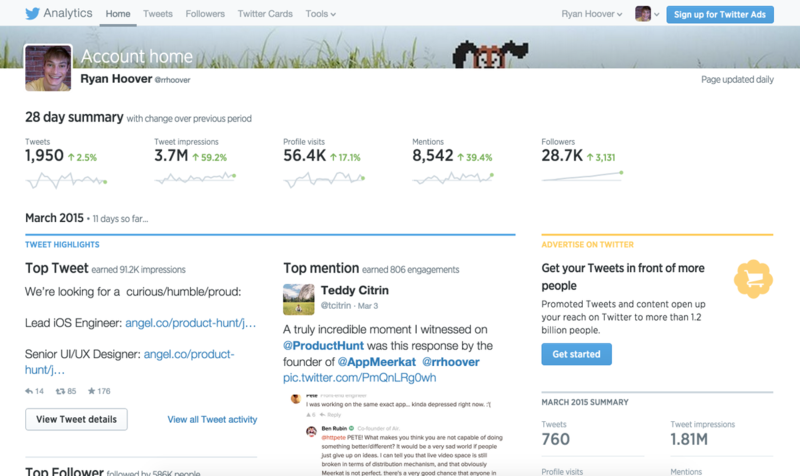 This is the first time we've shown you what your top Tweets, top new Followers, and top mentions are during the last several months. Also, new data that's being shared for the first time: number of people visiting your profile, number of people mentioning you, and a few other things. We want to build a space for people who are using Twitter for something beyond pure conversation and self-expression to learn over time and get better at whatever objective they're aiming for. Happy to answer questions! @ajt Thanks, Alex. Nothing to announce at the moment. @ajt Absolutely. And if you're in town again and want to get a drink, hit me up. @rrhoover My team's focus is on making Twitter work better for small and tiny businesses, marketers, etc. Since this is a hugely diverse set of accounts around the world with wildly different goals, we didn't try to guess what they needed... so we asked lots of them what would make Twitter more useful for their goals. A general dashboard with high-level stats and examples of things that are working well was at the top of the list. The other big thing they asked for is an easy way to see this stuff right in the apps. Yesterday we also launched "Tweet activity" on Twitter.com (iPhone and Android got it a couple months ago), so that you can see in real time how your Tweets are doing. @bentossell This. So bummed we can't download this to PDF. @bentossell Export as CSV is in our backlog. PDF currently isn't, but curious to hear more about your workflow. Would the "Print > Save as PDF" flow work for you? Or screenshots? If not, definitely explain further and I'll make sure we take note of it. @buster Export as CSV will be glorious and feeds my charted.co addiction. @buster Export as CSV will be great. Well that is an option but doesn't quite format correctly for me. As I manage company accounts it would be awesome to export as pdf so that it can be shared with them. I like this, very clean and makes sense.